Do you want to know the best kept backstage secret? Preparing your hair before styling is everything. That’s why Toni&Guy developed a series of products to protect, smooth and prepare your hair for styling and help you create your look from the hair down. 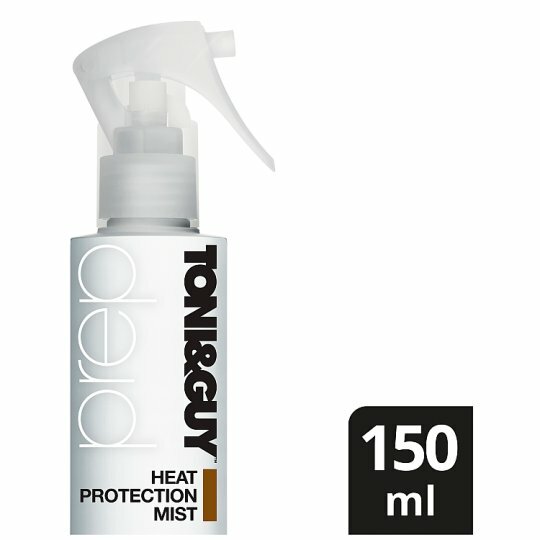 Our Heat Protection Mist controls and protects hair against heat damage from regular blow drying and heat styling up to 230°C, for a soft and smooth finish. Ready to create your style? Press switch at nozzle to unlock spray trigger. Before heat styling, spritz evenly over damp hair and comb through. Partner with one of our styling products to help create your look from the hair down. This product is also available in travel size, so you can use your favourite product on the go or on holiday. Born in London from a love of fashion, Toni&Guy products are inspired by catwalk looks and high street style, to create standout hair styles. Toni&Guy celebrates individuality, empowering you to express your style through hair and fashion and to create your look from the hair down. Looking for hair style inspiration? Check out our website toniandguy-products.com for professional tips on how to achieve salon inspired hair styles. Go to allthingshair.com for hair tutorials, trends and product recommendations. We would love to hear your thoughts! If you enjoyed using this product, please share a review.